While the concept of theosis (man becoming God) is a hallmark belief of the Mormon Faith, I was surprised to find out, that it was a part of another groups religious beliefs. This passage establishes the immutable (unchanging) nature of God. The character and nature of the Godhead, has not, will not, and forever will be the same. But I think it necessary to define terms. Theosis to me, means the deification (elevating man to the level of God) of man to a state equal in stature with the Godhead. And thus was the fall of mankind. We inherited a sin nature from Adam and Eve. Those who have tried to “be like God” have never, and will never succeed. The incarnation of Christ is crucial. The hypo-static union – the union of God and man was crucial to satisfying the full wrath and anger of God. Most people don’t like to hear about the wrath and anger of God. There is no room in the Godhead for man. The immutable nature of God makes that clear. The deification of man (elevating man to the same level as the Godhead) is inconsistent with the nature and character of God. What do the first two commandments say from Exodus 20? 3 “You shall have no other gods [b]before Me. You will have no other gods before me. That means we can NEVER be on the same level as God. God after all is a jealous God. seeing that His divine power has granted to us everything pertaining to life and godliness, through the true knowledge of Him who called us [d]by His own glory and [e]excellence. 4 [f]For by these He has granted to us His precious and magnificent promises, so that by them you may become partakers of the divine nature, having escaped the corruption that is in the world by lust. 5 Now for this very reason also, applying all diligence, in your faith supply moral [g]excellence, and in your moral excellence, knowledge, 6 and in your knowledge, self-control, and in your self-control, perseverance, and in your perseverance, godliness, 7 and in your godliness, brotherly kindness, and in your brotherly kindness, love. 8 For if these qualities are yours and are increasing, they render you neither useless nor unfruitful in the true knowledge of our Lord Jesus Christ. 9 For he who lacks these qualities is blind or short-sighted, having forgotten his purification from his former sins. 11 for in this way the entrance into the eternal kingdom of our Lord and Savior Jesus Christ will be abundantly supplied to you. Again it is necessary to define terminology. What is meant by partakers of the divine nature? The word “divine” (theios in Greek) is used in verses 3-4 means God’s nature. The word does NOT mean essence. It refers to God’s moral character, as verses 5-11 go on to explain. We need exegesis, not eisegesis. Full and complete context. The passage does NOT mean the elevation of man on equal par to the Godhead. This is not an ontological issue. The problem is NOT that man is a creature and needs deification. The issue is that man is a sinner. As R. C. Sproul Jr. said: (They) believe that the glory of Christ is not that he atoned for our sins, but the incarnation. 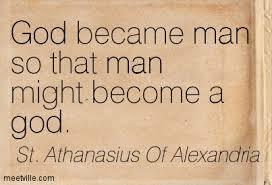 That God became man. We don’t have that problem. Not in the reformed world. We don’t think that our problem is that we are creatures. But do we really believe that our problem is, that were sinners? Theosis is scripturally inconsistent with the character of God as revealed in Scripture. Perhaps now you can see why Reformed Doctrine (and l) place an emphasis on Sola Scriptura (Scripture Alone).